March Madness with the Wacky Watercooler Blog Hop! We’re not as mad a March hares, but we’re certainly here to have fun! This month, we’ve decided to add a little bit of ‘zany’ to our blog hop – but in a good way! We’re all featuring our distinctive stamping styles with fancy folds – paper folds, that is – to create special cards & projects. Everything else is the same; our blogs are linked in a circle, so as long as you keep going one direction, you’ll be taken through all the blogs, and see all the fabulous we have created just for you! You’ve probably arrived here from the amazing Christine Giuda’s blog – have you had time to put your socks back on yet?! If not, then you’ve traveled backwards, and just seen the projects of the incomparable Buffy Cooper! I’m in quite a cozy spot, between these two wonderful ladies. So, let’s start with my first project – I wanted to showcase some of the new Sale-a-bration product, called Sheer Perfection Vellum. This vellum paper stack has some great patterns, and you can either leave them as-is, like I did here, or you can colour them (on the front or the back) with markers, blendabilities, sponges – and they look great! I started with a card base of Pacific Point card stock; it seems to be my new favourite blue! I then layered the scallop patterned vellum paper over it, and attached with Glue Dots. I cut a strip of Chalkboard Paper, and stamped 2 of the small flowers from the Flower Patch stamp set in Rose Coral Chalk Ink. I stamped the sentiment onto another piece of Chalkboard Paper, using the same chalk ink, and cut a banner tail in one end. I stamped the 2 flowers using the same Rose Coral Chalk Ink, but this time I stamped onto Whisper White card stock – it looks much brighter, doesn’t it? 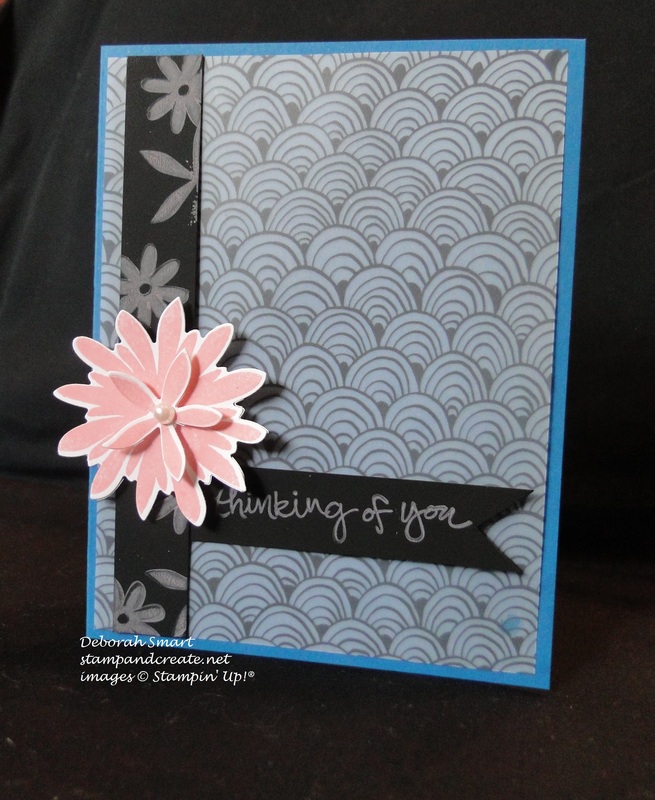 I layered the flowers using Stampin’ Dimensionals, added a Basic Pearl embellishment to the center, and this quick & easy card was finished! This was the challenge thrown down from Bev – a photo challenge. Amazing inspiration, but a challenge to come up with my own interpretation! My final card is my special ‘fancy fold’. I have to admit, knowing the creative ladies in this hop, I knew I had to find something unusual – after all, they’re not only talented, but the theme is ‘March Madness’, right? So, I went to one of my favourite sites for inspiration – Splitcoaststampers! 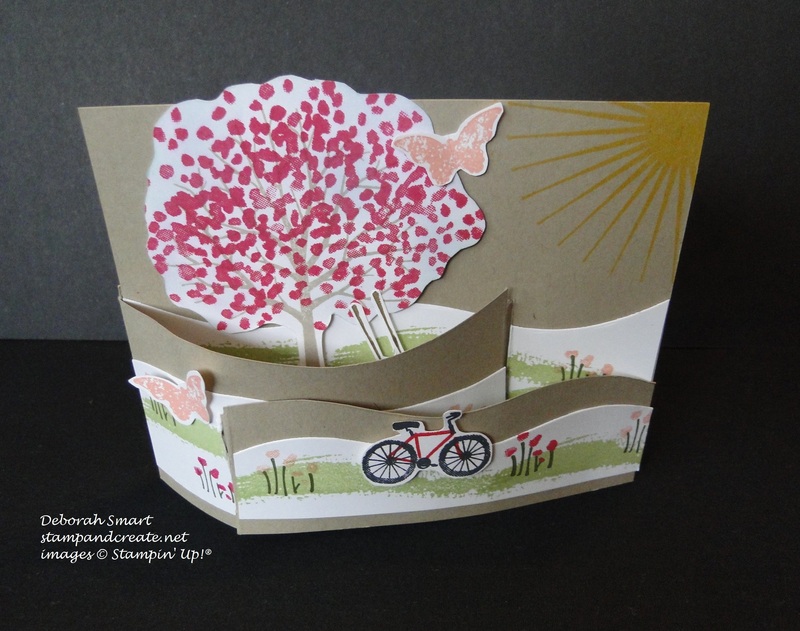 They have an incredible wealth of visual inspiration and a bounty of tutorials – so I chose to try out making my very first Bendi-Fold Card. 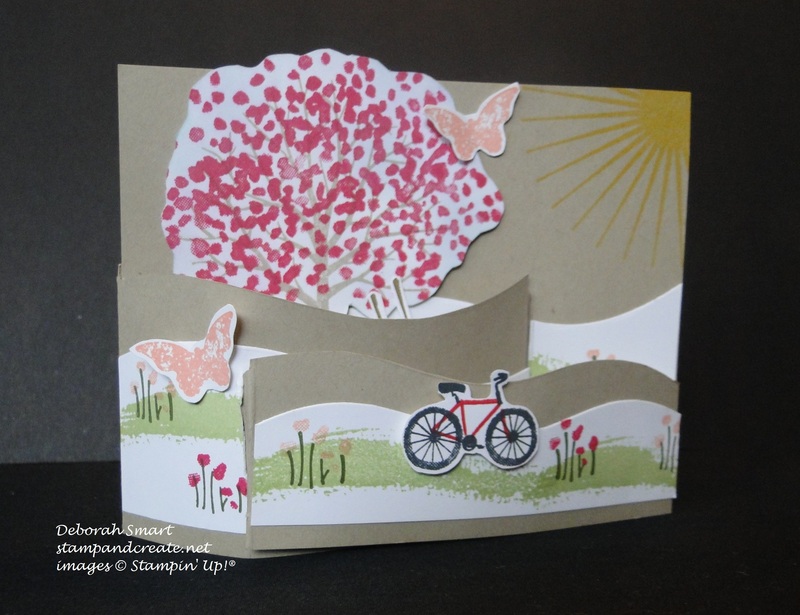 I used Crumb Cake cardstock for a neutral card base, and did my stamping onto Whisper White cardstock. 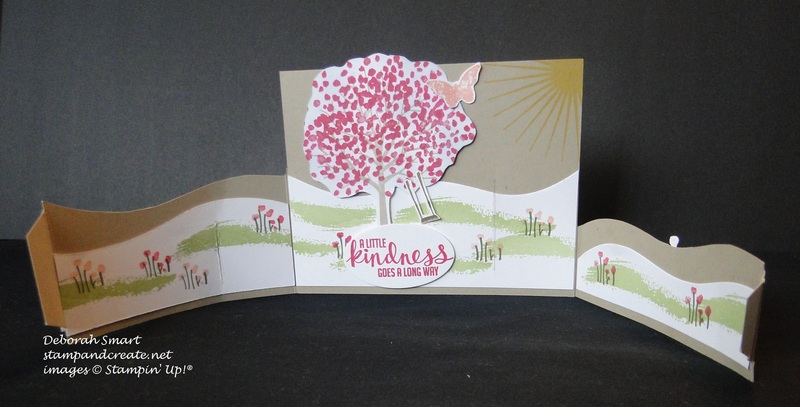 I stamped the images from Sheltering Tree, hand cut them and attached them to the base using Stampin’ Dimensionals. The butterflies are from the Kinda Eclectic stamp set, as is the sun image, which I stamped directly onto the card base. The colours I used were Melon Mambo, Crisp Cantaloupe, Old Olive, Mossy Meadow, Crumb Cake and Daffodil Delight. 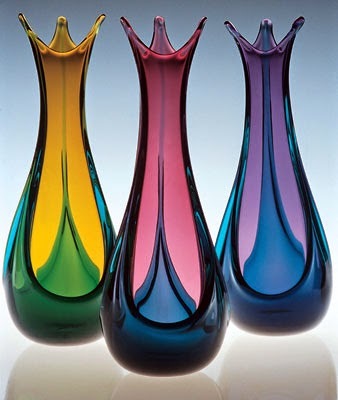 I hope you’ve enjoyed my projects for this edition of the Wacky Watercooler Blog Hop; if you have a minute, I’d appreciate it if you would leave a comment; I love reading what you have to say. Now, head on over to see the incredible projects that Buffy has waiting for you – just click the ‘Next’ button. If you’d like to go back & revisit Christine’s blog (and no-one would blame you!) just click the ‘Previous’ button. If you want to start at the very beginning again, click the ‘Home’ button. I have also listed all of the participating blogs, in order, at the bottom of this post, for your convenience. Next Next post: Open House Fun & Games! Love what you’ve done with that Vellum, Deb! And what fun your bendi-card is. I’ve been watching that bendi card technique. So cute. The vellum card is so sophisticated looking. Love it. Both of them. Thanks for your nice comments, Christine! I’d love to see what you create with the bendi-fold; it’s such fun, and I think it has amazing possibilities – perfect for your creative mind! Wow! Your bendi card is so cool. Thanks, Kath! It was fun giving it a try. I think I’ll be using it again for some Christmas scenes! 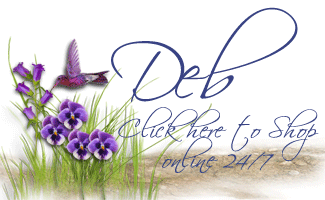 fun projects, Deb! I always feel inspired by your creations! Hi Ter!! Thanks so much for stopping by 🙂 I’m glad you liked my projects for this hop – I hope you’ll join us again sometime soon! Wow, Deb. First of all, with regards to the Watercooler Challenge, great work. That card definitely shows the inspiration from Bev’s photo. Nicely done. As for the blog hop, Love the cards. That first one featuring the Sheer Perfection Vellum is very elegant. I love the one pop of colour from the blossom. Your bendi-fold card is intriguing. I’ve never made one and am itching to try one. What an awesome idea. Nicely done! Oh, and, of course, thank you so much for being part of the blog hop. 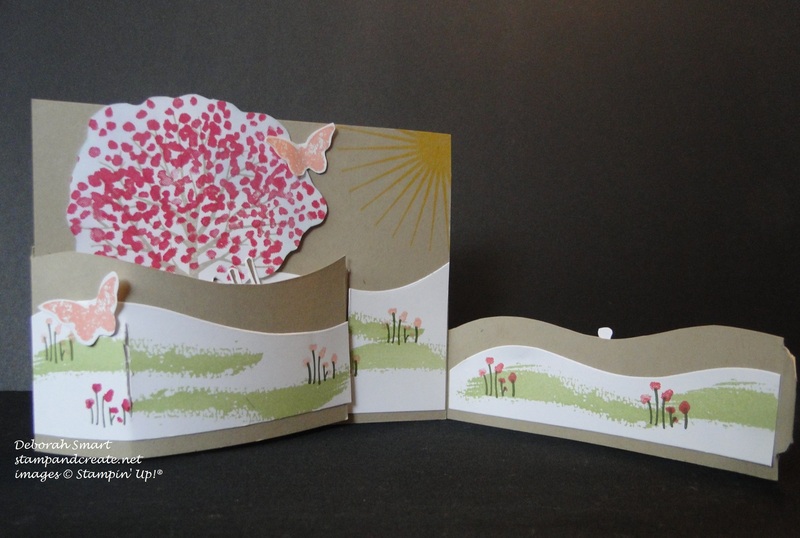 Thanks so much for your kind comments, Heidi – on both my challenge card & the hop cards 🙂 I can’t wait to see what you come up with, if you make a Bendi-fold card – I’m sure it’ll be great! How about that? A Blendi-fold. I want to try that, but yours is so lovely, I’ll have to CASE it! And the vellum cards are beautiful with their muted colors. I am so glad you all went “mad” with your projects this month! Deb, lovely cards. I don’t have any of the products that you used, so enjoyed seeing your creations! Your stained glass card is my favourite Deb! Gorgeous fancy fold, Deb, but I LOVE your take on the challenge. Daubers on the back of the vellum? Genius! So pretty and soft. Aw, you’re so kind, Buffy! Glad you liked my take on the challenge; it was a challenge for me, this time, but it was fun! I really love the simple layout but sophisticated look to the Sheer Perfection Vellum card. It was a show stopper for me! I will have to give that layout a try! 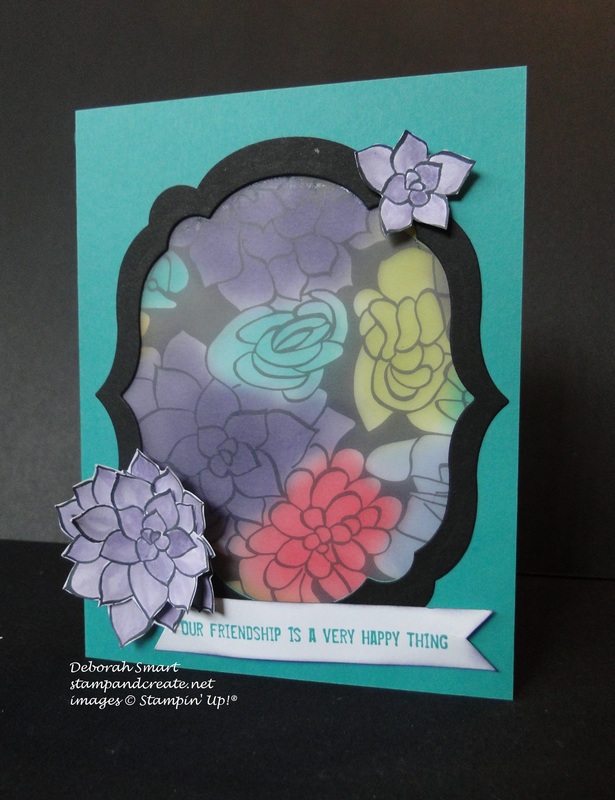 Love the stained glass card and the fancy fold card is really fun! So glad you like what I did with the Sheer Perfection Vellum, Marie 🙂 I’m having more fun using it that I thought possible! Deb you never fail to amaze me with your many talents. I really love all three of your cards. The Sheer Perfection Vellum is stunning and after seeing your cards, I know I have to get some before it’s too late. The Bendi card is fabulous, what a scene stealer! Great projects, Deb. Love your fancy fold card.